The number of social networks in which merchants participate is on the rise. In addition to the big three — Facebook, Twitter and LinkedIn — we now have Google+, Instagram, Pinterest, Tumblr, and many others. Keeping up with all these from a merchant perspective is difficult enough, but the consumer who wishes to find and follow the brand across multiple networks is at an even greater disadvantage. Some companies have found a way to tie these disparate networks together via a “social hub” that resides on the company website. A social hub is a digital property that collects the content posted on social networks and displays it together in one place. It provides an at-a-glance snapshot of a company’s activity on social media and makes it easier for customers to find and follow the brand. Social hubs may or may not contain user-generated content such as photos or tweets. They also enable the merchant to exert greater control over the content that is presented. In addition, social hubs give otherwise static websites frequently updated, fresh content that can keep visitors engaged for longer periods of time. Serve as the company blog. Creating a social hub does not have to be difficult, nor does it require a great deal of technical expertise. Here are two easy-to-use, inexpensive tools smaller merchants can use to set up a social hub on their ecommerce websites. Tint aggregates and curates content from social networks. Tint aggregates and curates content from social networks and pulls them together on a single page, which can be embedded into the merchant’s website, blog, Facebook page, or mobile app. Merchants can link their Twitter, YouTube, Pinterest, Instagram, Facebook, and RSS feeds to their Tint account, and the service auto-populates the page from those feeds in a format that resembles Pinterest. Users can customize pages by changing backgrounds, colors, fonts, layouts, and themes. Follow these steps to set up Tint. Go to Tint and sign up. You will be asked to create a new “tint,” which is simply a unique URL to associate with your account — for example, http://www.tintup.com/pchaney. Connect your social media accounts. Personalize the site by choosing a theme, background color or image. Select the page width, height, number of columns, and whether or not to auto-extend — or infinite scroll — and then generate code to embed the page on your site. Tint provides embed options for WordPress, Facebook, Blogger, and several other content management platforms. An HTML option is available that any site can use. Tint includes embed options for several blog and content management platforms. 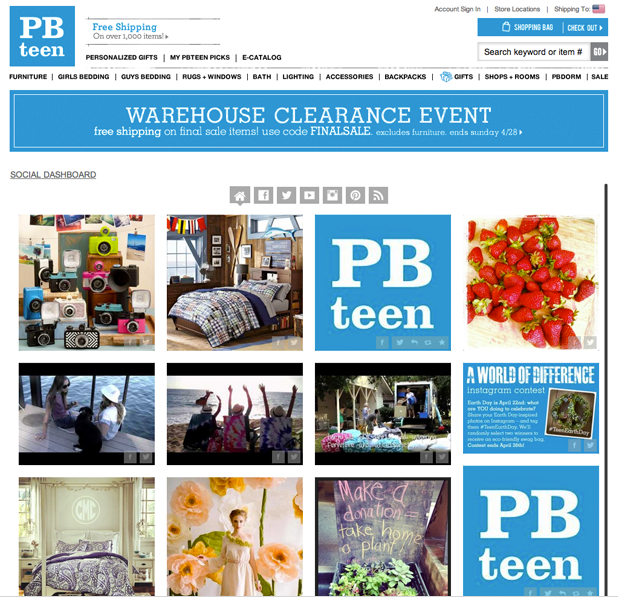 Williams Sonoma used Tint to display visual content on its PBTeen social media outlets. PBTeen uses Tint to display social network content on its website. 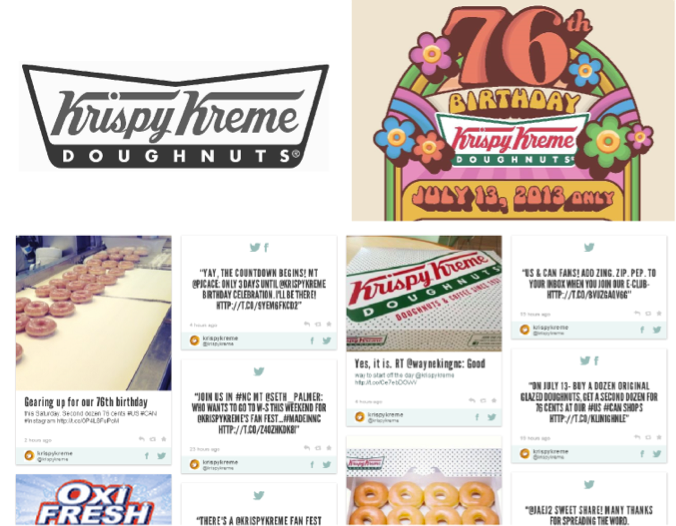 Krispy Kreme utilized the platform to generate interest for its 76th birthday social media campaign and to get people into stores for a “Buy a Dozen, Get a Dozen” promotion. Krispy Kreme leveraged Tint to promote its 76th birthday. The basic plan is free and provides users with the ability to pull in two sources. Premium plans start at $50 per month. RebelMouse calls itself your "social front page." 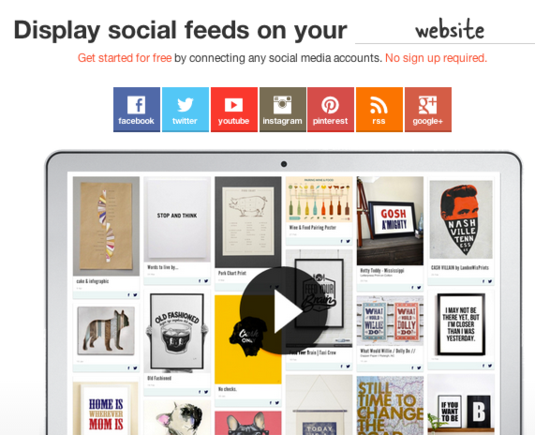 RebelMouse is another social hub platform that positions itself as your “social front page.” Similar to Tint, it also uses a Pinterest-style interface. To set up RebelMouse, follow these steps. Go to RebelMouse and sign up with your Twitter, Facebook, Instagram, or Google+ account. Add your social media accounts. RebelMouse supports Twitter, Facebook, Instagram, Pinterest, Flickr, Google+, LinkedIn, and Tumblr. You can also pull in content from RSS feeds. Choose a design. RebelMouse offers several templates and layout options, or you can create your own design using CSS. You can also upload a header graphic similar to the one in the following example. Users can create a large graphic header for branding and promotion. Go to the embed section of the RebelMouse dashboard to generate HTML code that you can copy and paste into a page on your website. Once your page is created, content will begin to auto-populate from the prescribed social networks and feeds. Using a simple toolbar you can position entries where you want them to appear on the page, as well as edit or remove existing entries and see statistics on the number of times an entry has been viewed. Content can be entered directly into RebelMouse, which gives it the functionality you would expect to find on a blog and makes it more of a publishing medium. RebelMouse offers an email subscription option and connects with MailChimp to provide greater customization and control. It also integrates with Google Analytics for more in-depth statistics. RebelMouse is free to use. A premium version with more features is available for $9.00 per month. 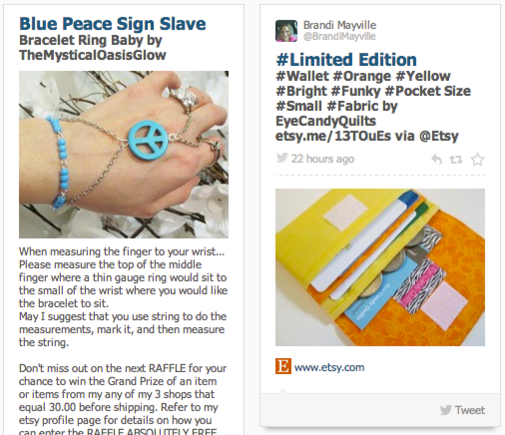 Etsy seller Mystical Oasis uses RebelMouse to promote its creations. 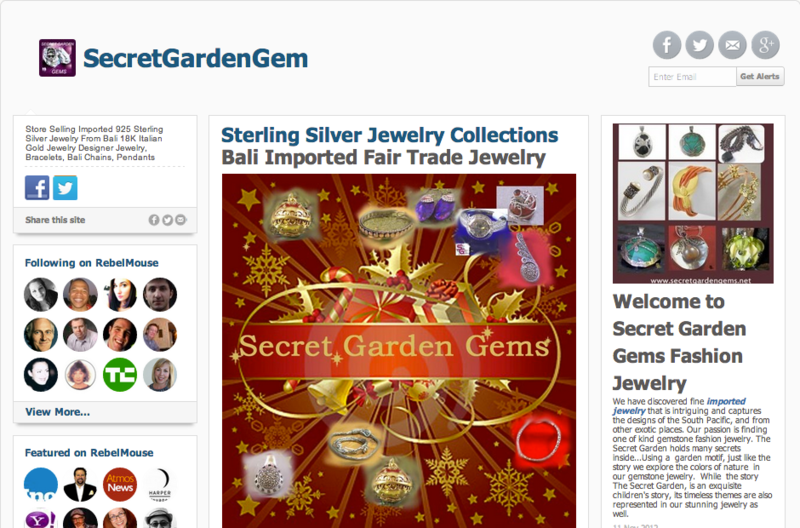 Jewelry retailer Secret Garden Gems lists products on its RebelMouse site. Social hubs give merchants a way to gather all their social network content into one place, embed it on their website, and use it to promote products, curate content around relevant topics, and stimulate engagement with customers. These free or low-cost tools provide an easy on-ramp to social hub creation and should interest smaller merchants.